You don't have to be a celebrated iris hybridizer to create lovely, never-before-seen varieties of irises. It just takes some basic know-how and a good measure of luck. 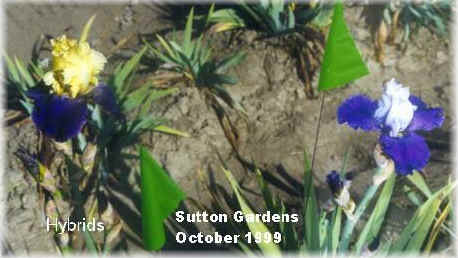 In fact, some award winning iris were flukes.To the average gardener, hybridizing irises may seem an awesome task. But it is really quite easy. Just begin with about a half-dozen or so of the best varieties you can find. Before attempting a cross, study the anatomy of the iris to recognize the reproductive parts. Below is very brief and basic instructions. Serious iris hybridizers join AIS (American Iris Society) and make contact with other hybridizers. 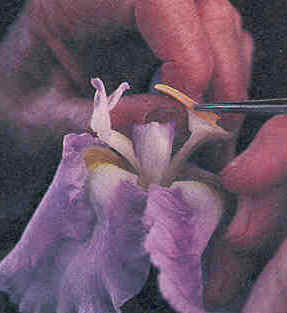 Step 1: Select two flowers that are just ready to open and carefully pull down the falls to reveal the reproductive structures.Step 2: Using tweezers, remove an anther (the pollen-bearing filament) from the iris chosen to be the male parent.Step 3: Brush pollen from the anther against the underside of all three stigmas (small liplike structure on the lower surface of each style, pollen-receiving portion) of the female parent. Rub firmly and gently until the pollen sticks.Label the pollinated flower with weatherproof tags to identify both parents. Most breeders list the year followed by the female parent first (the flower receiving the pollen) and the male second with a "x" between the two parent names.For most tall bearded crosses, no protective coverings are used to prevent random pollination by bees or insects. 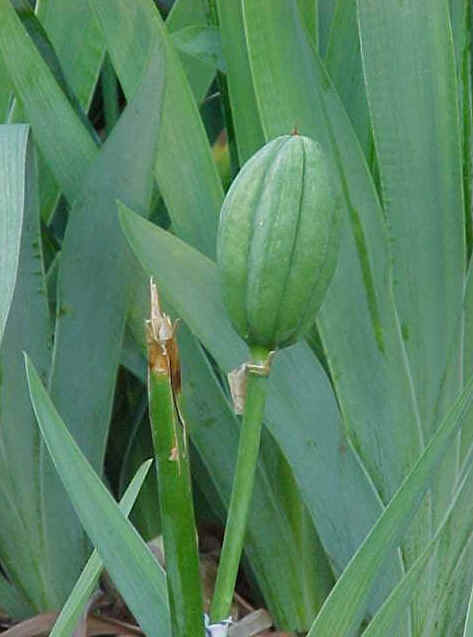 With some bearded iris varieties, the foliage may be secured using twist-tie. If the pollinating was successful, the ovary (the ovule-bearing pod at the base of the flower) will begin to swell within seven to 10 days. In the fall, when the pods resemble a light brown walnut shell and the top of the pod begins to crack, it is time to collect the seeds. Most pods contain 20 to 50 seeds. Crack open the pods and remove the seeds. For some non-bearded iris, the plant's seeds may be placed into individual plastic bags, dust them with a pinch of fungicide powder, add a drop or two of water for moisture and tie up the bag. Carefully label the containers. 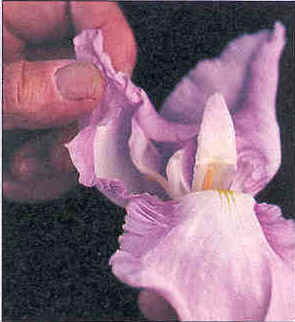 For Bearded iris, place the fresh seeds into a dry, clean receptacle such as an envelope or dixie cup. Make sure these seeds are kept dry and well aerated to prevent mold formation. Carefully label these containers. By fall, the seeds will be ready to plant. Tall bearded iris seeds may be planted October or November before winter arrives. Plant the seeds about 3/4 inches deep and about one inch apart in light, well-drained soil. Again, carefully label each planting area. Most seeds will germinate the following spring, mature into rhizomes in the summer, and bloom the second spring. There is a lengthy wait from initial pollination to the first blooming. Below is a picture from the Sutton's Green Thumber in Porterville, California, which was submitted by Mike Sutton to the iris-photo email list. The picture shows how uncontrollable the RNA gene pool can be to a hybridizer. Thanks goes to the Sutton family for their generosity to customers and for their contributions to the advancement of the Iris flower.